On September 20, at the open meeting of the Federal Energy Regulatory Commission (FERC), FERC’s General Counsel, James Danly, and Howard “Skip” Elliott, Administrator of the Pipeline and Hazardous Materials Safety Administration (PHMSA), presented the recent Memorandum of Understanding (MOU) between the two agencies to establish a framework for improving coordination and the exchange of information when performing the siting and safety review of FERC-jurisdictional proposed liquefied natural gas (LNG) facilities. According to Mr. Danly, the new MOU will enable the Commission to act on LNG applications more quickly, reduce the burden on applicants, and facilitate increased exports. Mr. Danly explained that the number of applications for LNG export terminals has increased substantially in the last eight years, and FERC’s process of certifying that these projects meet federal safety standards has become increasingly complex and burdensome. Traditionally, under that process, FERC staff made a preliminary determination that the proposed LNG facility met PHMSA’s safety standards, but the process requires numerous queries to PHMSA and applicants before FERC staff has sufficient information to make its determination. According to Mr. Danly, the MOU will end this duplicative and iterative process and will allow PHMSA to make a preliminary determination on safety issues and certify it to the Commission. Administrator Elliott said the MOU will bolster America’s status as a net exporter of LNG, adding that the U.S. already exports LNG to over 25 countries internationally. PHMSA Rulemakings Update. The tables below summarize the status of the PHMSA’s pending pipeline safety rulemaking initiatives as reflected in the Department of Transportation’s (DOT) August Significant Rulemaking Report and the Office of Management & Budget’s (OMB) Office of Information and Regulatory Affairs (OIRA) Spring 2018 Unified Agenda of Regulatory and Deregulatory Actions. The Unified Regulatory Agenda appears in two principal parts, Current Agenda Agency Regulatory Entries for Active Actions and Current Long Term Actions. DOT has not released a September Significant Rulemaking Report. Under Executive Order (EO) 12866, OMB reviews proposed significant rules to ensure they are consistent with applicable law, the President’s priorities, and the principles set forth in the EO, and to ensure the proposals do not conflict with another agency’s policies or actions. OMB also analyzes the cost-benefit analyses in support of the proposals. The EO sets out deadlines for OMB evaluation, but review periods are often extended. PHMSA announces 2018 pipeline safety and hazardous materials grants. On September 27, PHMSA announced that it will issue almost $90 million in grants for FY2018 from its pipeline and hazardous materials safety programs. PHMSA will award $3.7 million to reimburse 4 states for activities related to their safety oversight of underground natural gas storage facilities; $56 million in Pipeline State Base Formula Grants to 46 states, the District of Columbia, and Puerto Rico to fund their pipeline safety programs; $1.1 million in One-Call Grants to support 46 projects in 31 states; $1.5 million in State Damage Prevention Program grants to support 24 projects in 24 states designed to improve existing damage prevention programs; and $1.5 million in Technical Assistant Grants to local communities and groups of individuals to fund 20 projects in 14 states. 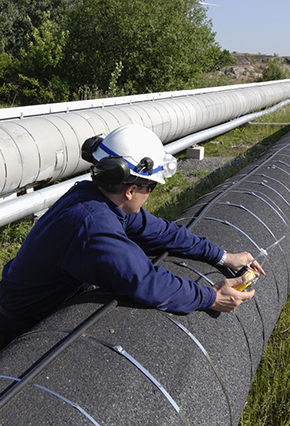 PHMSA announces CAAP grants to support pipeline safety technology. On September 28, PHMSA announced that it is awarding over $3.8 million to 11 universities as part of the Competitive Academic Agreement Program (CAAP) for pipeline safety research innovation. The grants will be used to promote the development of research projects that could prevent or mitigate pipeline corrosion and to mitigate other pipeline safety challenges. PHMSA submits report to Congress on OPS actual staffing and hiring plan. On September 5, PHMSA submitted a report to Congress regarding the Office of Pipeline Safety’s (OPS) actual staffing in FY2017 and hiring plan for FY2018. During FY2017, OPS staffing increased from 285 to 292 full-time personnel. OPS hired 30 pipeline safety employees, including 17 inspection and enforcement staff, and 23 employees departed the agency. In FY2018, OPS received funding for 308 pipeline safety positions, and on September 30, 2017, 292 (95%) of those positions were filled. Of those positions, 205 were dedicated to inspection and enforcement. Of OPS’s 16 vacancies, 12 were inspection and enforcement. The report describes PHMSA’s efforts to recruit and retain employees. The Common Ground Alliance releases 2017 DIRT Report. The Common Ground Alliance (CGA) released the Damage Information Reporting Tool (DIRT) for 2017 which analyzes damage and near-miss events from excavation activities related to buried facilities. On September 26, Governor Charlie Baker announced that the Massachusetts Department of Public Utilities has been directed to retain an independent consultant to examine the safety of natural gas distribution systems in Massachusetts. The assessment, which will examine the physical integrity and safety of natural gas distribution systems and the operation and maintenance policies and practices of gas distribution companies operating in Massachusetts, was ordered in the wake of the September 13 incident involving Columbia Gas of Massachusetts.